A: How thoughtful of you! Your wife is going to love your surprise! 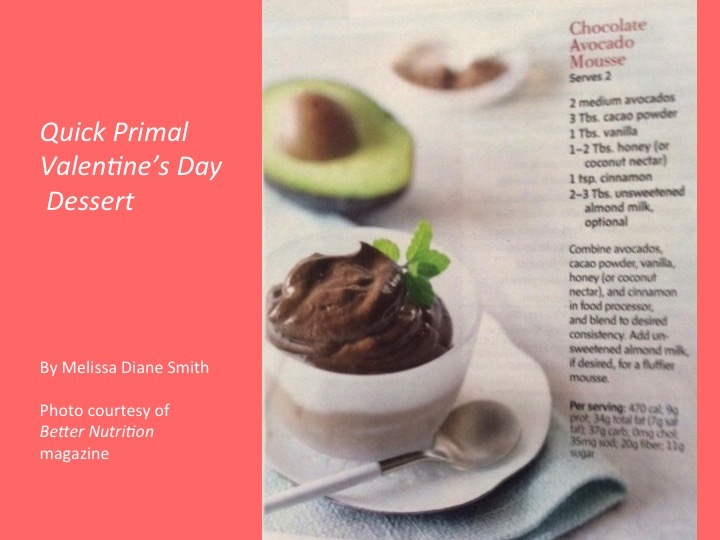 Among the many great things about the Paleo/Primal Diet is that it’s easy to use a handful of quality, whole-food ingredients to prepare a decadent, gourmet-tasting dinner with little fuss. Grains and legumes take a lot of time to cook. By cutting out these ingredients, you can really cut down on the prep time.Just think about your wife’s preferences, and decide on red meat, poultry, or seafood. Then add some tastily prepared vegetables and a yummy, easy-to-fix dessert. The Paleo and Primal eating plans both avoid grains and legumes, which drastically cuts down prep time. 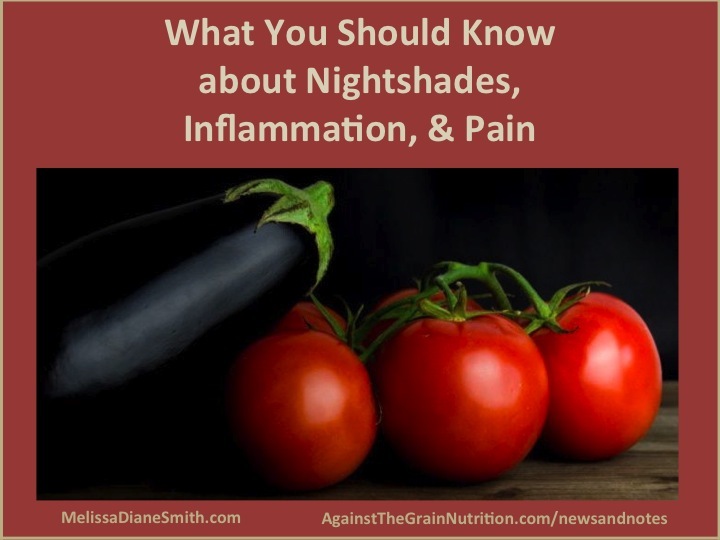 Q: I’ve heard the term “nightshade foods,” but I don’t know what foods those are. I’ve also heard that some people avoid them. Why? —Maria G., Yuma, Ariz.
A: Nightshades are the common name for flowering plants that belong to the botanical family Solanaceae, which contains more than 2,000 different species. Many nightshades are poisonous and should never be eaten, including belladonna, also known as deadly nightshade. Several nightshades, however, are very popular foods—tomatoes, potatoes, eggplant, all types of sweet and hot peppers, cayenne, chili powder, paprika, pimentos, tomatillos, chilies, goji berries, and ashwagandha (an adaptogenic herb used in Ayurvedic medicine). In fact, in the U.S., we consume almost 230 pounds of nightshades per person per year. 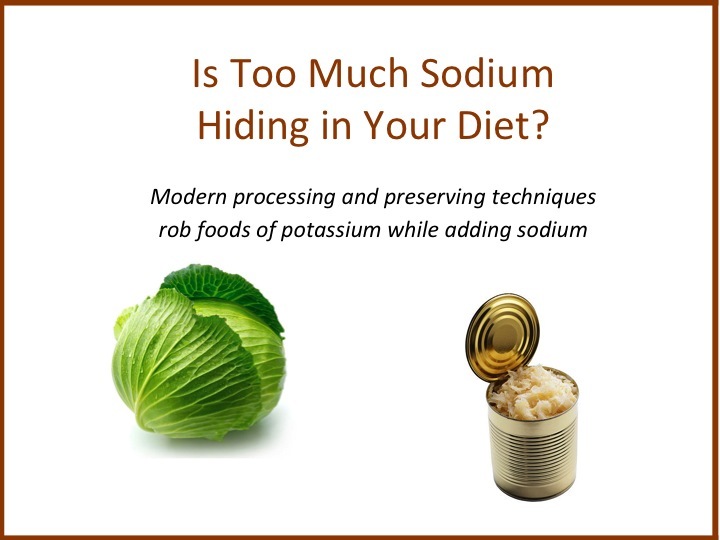 Too Much Sodium Hiding in Your Diet? To protect against high blood pressure, avoid processed and prepared foods, and emphasize whole foods that are naturally rich in potassium. A: The dangers of sodium are very clear: Too much can raise blood pressure, and high blood pressure is the leading cause of death from heart disease and stroke in the United States, contributing to more than 1,000 deaths every day. Unfortunately, the average American adult consumes 3,400 mg of sodium daily, nearly 50 percent more than the 2,300 the federal government recommends. So we should hide all the salt shakers, right? Not so fast. I am delighted to be a featured speaker during the Grand Opening of the new Natural Grocers natural food supermarket at 5600 E. River Road in Tucson this month. 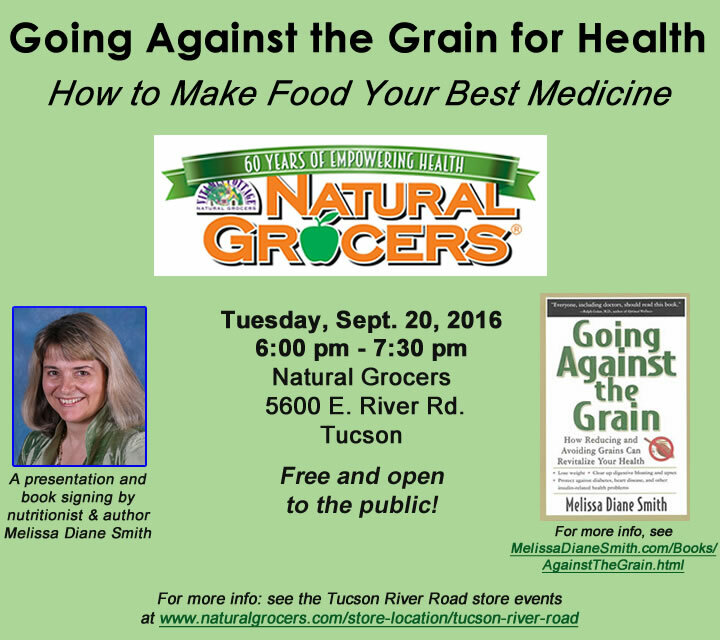 On Tuesday, September 20, 2016, at 6 p.m., I will present “Going Against the Grain for Health: How to Make Food Your Best Medicine.” In this presentation, I’ll cover the health troubles caused by refined grains, whole grains, gluten grains, and genetically modified ingredients hidden in grain-based foods, and explain how to use this information to lose unwanted weight, reverse disease processes, and revitalize health. I’ll also give my answers to common questions I receive, such as “was wheat always not good for us, or has it become worse for our health in recent years?” and answer any other questions that you have. 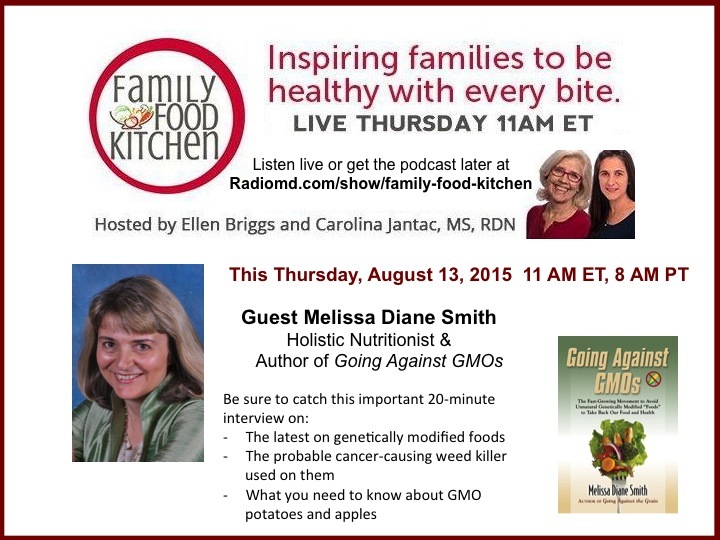 On Thursday, August 13, 2015, at 11 a.m. Eastern time (8 a.m. Pacific), catch the live interview with me, Melissa Diane Smith, on the Family Food Kitchen radio program on RadioMD: http://www.radiomd.com/show/family-food-kitchen. You can also listen over the phone by calling 844-305-7800. In two 10-minute segments, hosts Ellen Briggs and Carolina Jantac will ask me to fill you in on the latest about genetically modified (GM) foods, frightening and disturbing news about the weed killer used on most of them, and what you need to know about GM potatoes and apples. If you can’t listen to the broadcast live, go to RadioMD a day or two after the interview, get the podcasts of the two segments, and listen to them at your convenience. Ready for instant access to some quick tips and healthy gluten-free food ideas to help you during the holidays and month to month throughout the coming year? You can now get the e-book version of my book Gluten Free Throughout the Year: A Two-Year, Month-to-Month Guide for Health Eating for the super-low price of $4.99 here. I brought the price way down as a holiday gift for clients and readers of my books! My favorite recipes for the holidays in the book are Butternut Squash with Fresh Sage, Chestnut Stuffing (I’d suggest doubling the recipe, though), Pecan-Pear Autumn Sundaes, Savory Quinoa Hash, and Savory Stuffing. There are also tips for every season of the year, partying gluten-free style, cold and flu prevention and relief, and heartier breakfasts to start your day to prevent blood sugar highs and lows. at Rillito Raceway Park, 4502 N. 1st Ave.